Easy to maneuver, the navigator rides on smooth glide rubber wheels for effortless vacuuming around furniture. Its swivel steering makes moving around furniture and from room to room a breeze. The shark navigator traps dust and dirt so the navigator never loses suction and cleans the last room as well as the first. A 30-feet power cord lets you clean multiple rooms from a single outlet. The navigator power nozzle makes quick work of pet hair on carpets. The 16-inch crevice tool reaches hair in tight spaces. The navigator is ideal for bare floor cleaning; the electronic brush roll shutoff stops the brush roll for superior bare floor cleanup. The super stretch hose gives you a long cleaning reach and the large bagless dust cup means there are no bags to replace. This small-medium sized vacuum has amazing suction - even more suction than previous Shark models. Air-flow is not lost, even with amazing hose length. With the 16" extension wand, 16" crevice tool and 30' cord, it is possible to clean a space almost 40 feet from the plugin! This vaccum was greatbto get small things like dust. Even if the floor looked clean there would be something it had collected. My only complaint was after a year it just stopped sucking good and the hardwood brush became stuck down so I jad to throw it out. I have multiple pets and two teens in my household. This vacuum is hands down amazing for keeping up with all of them. Worth every penny! Love my Shark, But could improve to not fall over easily. I have loved my Shark vacuum since I bought it. Has the best suction out there. I used to have a Dyson and my Shark is much better. I love that the suction is so strong and you are able to adjust the suction as needed. I have 5 dogs and it does a great job at getting the dog hair trapped in the carpet. It amazes me how much it picks up. Pro: Awesome suction, long cord, and great attachments. Con: I wish it didn't topple over so easily when I go to use the hose. If I don't have my hand on the vacuum it will fall over, which can be a pain when you need both hands for areas. I hope Shark can figure out how to prevent this from happening. Love love this vacuum. Save your money but this one. Great on dog hair. Easy to clean filters. Light weight. We have owned for two years now and would buy again. I used to use average Bissell vacuums, nothing too expensive or fancy. Then I visited my dad one weekend, and he raved about this new vacuum cleaner that he had recently bought. He showed it to me, and I used it to try it out. 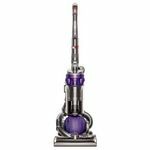 I instantly loved it and could tell a difference in how much better it worked than the vacuum I had or any I had before. 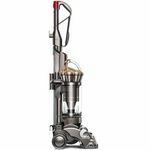 I quickly upgraded mine to the same model as soon as I had the available money for purchase and won't be going back to the other vacuums I was using in the past. I like how easy it is to maneuver and it doesn't take a lot of effort to push it. It does a good job at picking up the debris and doesn't leave junk behind like others do even after more than one pass over. Spending a little more money was definitely worth it for this! Great product for a reasonable price! 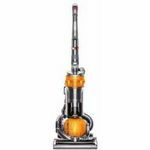 I have used several vacuums, including many shark vacuums, and this is my favorite one yet! We have an Australian Shepard, a long haired cat, a preteen, and a toddler so we are definitely not strangers to messes and have worn out our fair share of vacuums. This one is still going strong after almost two years! It amazes me how much pet hair (and long blonde hair from myself and the girls) that this vacuum can pick up! I vacuum daily and you would never know that we have some serious shedding going on inside our house. I love that the attachment easily connects and that it has a light at the end of the longest attachment that is perfect for vacuuming in couch creases. My only complaint would be that is very occasionally clog when it picks up a stray Bobbi pin but I think that may be completely unavoidable in a house full of girls! The price is definitely amazing (and reasonable) for the efficiency of the vacuum! If this one wears out I would definitely buy another! I did not want to spend a lot of money on a Dyson, yet I wanted the suction and cleaning power of one. I found this in the Shark. First and foremost, I can not believe the amount of dirt and dust that this vacuum picks up - it is amazing. I think what I have been missing with my other vacuum that failed to pick up half of what this vacuum does. I also love the convenience of being bagless. It is easy to just detach the canister and empty the dirt directly into the garbage. In addition, I noticed with the bags, that there was always dust being blown around with the bag, instead of being kept in the vacuum. This does not happen with this one. And I do not have to spend money on bags. The attachments are so convenient and allow me to get in places that I never were able to in the past. I can vacuum underneath couches, behind them, the ceiling and drapes, anywhere dust would collect. 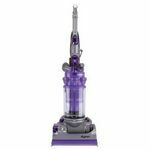 I would highly recommend this vacuum! I am so impressed at how easy this vacuum is to use! 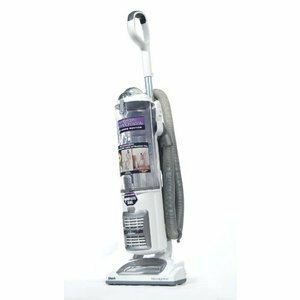 I have used inexpensive vacuums for years thinking they did a great job. Now that I have switched I cannot believe how much better this works. I absolutely love the floor attachment with the washable microfiber pad. It is super easy to switch to and cleaned my kitchen and dining room floors so much better. I was starting to see a few ant in the house last weekend and after using the vacuum I think they have given up looking for crumbs! Maneuverability The vacuum easily fits around my furniture and tables. Ease of Maintenance The filters are easy to clean and the canister is easy to empty. Suction Performance I was very impressed at how much small dirt was pulled up after using my old vacuum first and then following with the shark. Versatility I have the shark professional with the floor cleaning attachment. I may never sweep again! My floors are so clean. Design I would prefer it to be a little lighter and to fit under my couch better, but it is super easy to take apart and switch Durability I have only had it for a week so I can't rate this super fairly, but it seems very durable to me. I love every single thing about this vacuum cleaner! I've had to buy a new vacuum every year for the past five years because they all keep going out on me. Each one gets to the point, after only a few months of use, where they lose suction and start blowing dirt everywhere. I think I may have finally found a keeper with the Shark Navigator Professional! As a multiple pet owner, and the mother of two children, this is a godsend! Maneuverability This thing gets everywhere. The Shark Navigator Professional has a swivel head on it so it's super easy to turn. The head is also low enough to the ground that I can easily maneuver under my end tables, piano, dining room furniture, the edge of my kitchen cabinets, beds, even under the front of my fridge. The swivel head makes it super simple to get around corners, while staying up against the wall. This vacuum is also self propelled. That aspect weirded me out a little at first because I've never owned a self propelled before, but after I started using it I realized that it's so much easier to push. Ease of Maintenance Click a button and pop off what you need to clean. It's that easy! Just about every part comes off for easy cleaning. The filter is wonderful, you just pull it out, dust it off, and wash it every three months. No need to EVER replace a filter! Even the hose pops right off so you can clean it out or wash it. Everything is so simple to use. Suction Performance This little guy picks up EVERYTHING. The very first use amazed me. I had already gone over my living room carpet with my old vacuum, (which was worthless but I didn't know how worthless until I got the Shark), but when I ran the Shark over the same carpet I was grossed out by all the dirt and pet hair that was still left in my carpet. It sucked up everything! I put on the hardfloor attachment and used it on my tiled floor where I keep my dogs beds and the kitty litter box. It sucked up every single piece of kitty litter and pet hair on the floor, even the stuff that was in the cracks. I used it in my kitchen after that with the same attachment and it got all the little pieces of yuck that was on that floor. It even found a couple of pieces of cereal under the edge of my cabinets. SHHWWOOOOMMPPP!!! Everything sucked up! Versatility At first it doesn't look like there are many attachments, but surprisingly there are. There is a crevice tool, an attachment with a pad that you snap on to use on hard wood/tile/linoleum, and a little brush that can be used on furniture. The whole thing separates from the bottom so you can use it like a handheld and take it anywhere. Design I'm so used to cheap vacuums that this thing looks like it's from a sci-fi movie. LOL I love it. It's designed so it's easy to use and clean. The whole thing put together weighs about 18 pounds. Durability I have a good feeling that this vacuum will last a long, long time. I've already used it in every single room of my house and haven't had an issue with it yet. There are even little snags in my carpet (rent house) that other vacuums would get caught on and bog down, not this one! Nothing I have vacuumed up has slowed this baby down.